Dogs, cats, ferrets, chinchillas, horses, rabbits, guinea pigs, hamsters, parakeets, snakes, lizards, turtles, tarantulas, hermit crabs, even pet rocks. The list goes on and on. America is a nation in love with its pets. Based on the Greater Philadelphia Area’s profusion of pet-centric boutiques and spas, animal rescues and nonprofit organizations devoted to enhancing the quality of life for critters of every fur, scale and feather, pet owners in this neck of the woods are no exception. The bond between a pet and its owner—or, if you prefer, “pet parent”—is special, and we’re happy to celebrate that bond here. On the following pages are some of our favorite services, products and companies that underscore the love we feel for the animals with which we share our homes, our hearts and our lives. We present ourBest of Pets. Michael and Jennifer Clements wanted to do something special to celebrate the 12th birthday of Molly, their pit-husky-Rottweiler mix. Through an advertisement on Facebook, they discovered a service that, to them, truly seemed like the gift that keeps on giving. 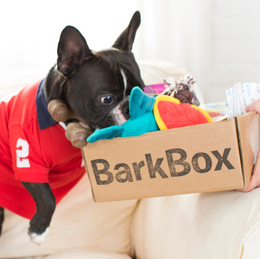 It’s called BarkBox, a curated box of all-natural treats, chews and toys, with packaging and products designed to—and this comes straight from the good folks at Bark & Co., BarkBox’s parent company— “create moments of insane joy for dogs.” The concept is simple enough: Dog owners visit the company’s website, barkbox.com, to determine the size of their dog (“small and cute,” “just right” or “big and bold”), select a delivery plan (one month, three months, six months or a full year) and, voila, within a few days the first package finds its way to the homeowner’s doorstep. So does BarkBox deliver on the promise? Six years ago, Newtown resident Jodi Specter decided she didn’t like the quality she was seeing from store-bought dog treats. So she decided to create her own. “These bones,” as it turns out, quickly became a hit. Using only pure beef marrow bones, coated with dried “human grade” chicken breast, Specter—a vegetarian, by the way—perfected the recipe over time and ultimately turned the bones into a brand: EataBulls. Barbara Schuster grew up in Lower Bucks County. Like many girls her age, she had a healthy obsession with horses. She did anything she could to ride them, to work with them, to simply be near them. As she grew older, she was able to find jobs that enabled her to take care of the animals she loved—everything from cleaning the stalls, to feeding them, to caring for their health. She even worked at racetracks, caring for thoroughbreds. In the process, however, she noticed that when she groomed the horses, the buildup of static electricity would sometimes shock and startle the horses. This, in turn, sparked a light bulb she quickly identified as an opportunity. In 2011, she started working on her idea, and by September 2012, she had a formal business entity—B Comfee LLC, based in Dublin—to bring her idea to life: Grooming Hands. Grooming Hands are unique, handmade gloves ideal for grooming horses. Each glove has a thermo-plastic palm with anti-static properties, as well as specially placed massage points for easy gripping and optimal pressure. Specialized tips on each glove’s middle and ring fingers enable the massaging of horses’ muscles, simultaneously acting as a brushing tool. Although ideal for loosening dirt, dead skin and parasites such as ticks, Grooming Hands also allow the user to wipe safely around a horse’s eyes, nose and other delicate areas. Schuster designed the product specifically with horses in mind, but Grooming Hands have proven an effective grooming tool for other domestic animals. The growing list includes not only dogs, cats and rabbits but also pigs and alpacas. Grooming Hands, which retail for $20 per pair, are available through the website groominghands.com, as well in bricks-and-mortar locations such as Weavers Way Co-op in Mt. Airy and KT Saddlery in Perkasie. Hero Dogs (hero-dogs.org) wholly lives up to its name, as the organization not only helps heroes—America’s underserved military veterans—but also creates heroes out of the dogs it places with veteran partners. The organization seeks to “repay people for their heroism,” says Jennifer Lund, who founded the organization in 2009 and currently serves as executive director. And the organization does just that, by raising and training service dogs to be placed, free of charge, with deserving veterans to help improve the veterans’ quality of life. The dogs help veterans who have been honorably or generally (under honorable conditions) discharged from the service and who have a disabling medical condition, whether or not that condition is related to his or her service. The hero dogs perform tasks including helping provide balance support, alerting his or her partner to sounds such as a doorbell or phone ringing, waking a partner from a debilitating nightmare or seeking help for a partner should an emergency arise. The process of training a hero dog is not a short one. In all, it takes three years for a service dog to become ready to go off with his or her veteran partner. The first two years are spent training the dog, and the additional year is spent training the veteran and dog together. Not all puppies make it through the training program; approximately one in three dogs “graduates” to become a successful service dog. “When I see the applicants to the program’s lives, they have been pretty dramatically changed,” Lund says. “Many veterans are really, really struggling and looking for a way to put their lives back together. A dog is not a miracle, not a cure, but it is a very, very powerful way for people to establish a connection, establish a relationship. In many homes, pets are as much a part of the family as a brother, sister or auntie; for this reason, it only makes sense to insure a pet in the same way one would insure a human relative. From retinal to audiological, from simple to complex, and from basic illnesses and lethargy to larger issues such as different types of cancer, pet insurance can address myriad issues. Pet insurance in the United States has been in existence for approximately 20 years, according to Jules Benson, BVSc, chief veterinary medical officer with Newtown Square-based Petplan pet insurance. Yet, he says only 1 percent to 2 percent of the 175 million cats and dogs in the United States are covered. Pet insurance works much like human insurance in that there are various levels of coverage, with varied annual limits. With Petplan (gopetplan.com), for example, one can opt for a plan with a deductible of $50, $500 or somewhere in between, with an annual limit of $22,000. These choices, as well as factors such as the age and breed of the pet, along with the area in which pet and owner reside, will determine the cost of a policy. The average policy, Dr. Benson says, costs between $380 and $400 per year. Pet insurance policies are useful for a number of reasons, centrally in helping out with unexpected medical costs. For example, in case of a severe medical ailment that could cost thousands of dollars, a family might find itself in the nerve-racking position of having to determine if it can afford to provide a pet with necessary treatment. It is important to note, however, that no pet insurance will cover a pre-existing condition, according to Dr. Benson, and quotes are based on the pet’s medical history. Unlike human insurance, however, there are no networks so pet insurance can be used at any veterinarian in the United States and Canada. The best ideas are born of necessity, as the old saw goes. You don’t have to tell Ira Stahl. He was driving to work one day, his two Pomeranians on the front seat beside him, when someone cut him off and forced him to stop suddenly. His dogs, Peanut and Little Bear, came away with little more than injured pride, really, but the incident stirred his inventor’s mind. The result is the K9 CarFence (k9carfence.com), a patented product of Stahl’s own design that enables dogs to travel safely and stress free, without harnesses, cages or confining seats. In matters of sudden stops, the K9 CarFence’s protective netting absorbs the negative energy of the pet’s forward movement, thereby keeping them safe. It also prevents pets from distracting the driver, which is critical because driver distractions caused by unrestrained pets have been linked to thousands of car accidents per year, according to Stahl. Given the right conditions, an unrestrained dog can have deadly implications—for the dog and the owner alike. K9 CarFence, which has been crash tested for dog safety, fits in the front passenger or back seat of any car and SUV, and it folds down quickly and easily when not in use. The company offers different versions of the product based on a dog’s size; the K9 CarFence TLC-2X, for example, is most appropriate for small to medium-sized dogs. As a value-added feature, K-9 CarFence also protects upholstery and leather seats from scratches often caused by the paws of a roaming dog. What’s more, the product is manufactured in the United States. “There’s a perception in America that a dog is more human like than wolf like, but that’s a misperception that can have consequences ranging from the minor to the fatal,” says Bailey, who has devoted his life to understanding canines and other animals he defines as “social predators.” “Dogs still have a phylogenetic relationship with wolves, and they still have the instincts that have been carried down through the ages. If his words sound cautious, even dire, it’s because he knows better. Yes, he has dogs of his own, which he considers part of his family, but he also understands what they are—animals that are wild at heart and deserving of respect. With his book, he simply wants dog owners to have a firmer understanding of how a dog’s ancestral ties to the wolf can affect its behavior. Although Bailey’s book is by no means a training manual, he hopes readers will use it to develop a more harmonious relationship with the “best friends” we, as a nation, have come to share our homes with. “Embracing the Wild in Your Dog” is available through tamingthewild.com, as well as through Amazon and other online booksellers. Bailey has also written “The Hammer,” a follow-up he refers to as “a dark book” about the aggressive side of dogs, due for a summer release. “I can’t imagine my life without a dog,” he says. “I’ve had pizza with my dogs, shared a McDonald’s cheeseburger with them; I’m sure they’ve lapped up some bad beer on occasion. That’s fun, but it ends there. When you come back to reality, you understand that a dog is still jaws, claws and paws, and it governs its world by those things.